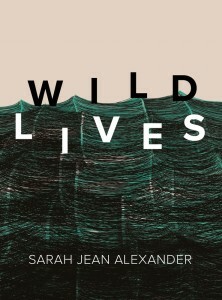 Sarah Jean Alexander’s first book, Wildlives, centers itself squarely in the 21st-century. Poems name check Google, PayPal, and even indie hip hop band WHY?’s 2008 song “The Vowels, pt. 2.” However, these poems also reference heaven, rain, and stars, decidedly timeless tropes of poetry. Which is not to say that these poems are cliché, simply that they mash up old and new to explore loneliness, lust, and love in a modern world. The biggest stars in the universe are called red supergiants. I shouldn’t have let you become mine. and you are at its peak. God is a good man. We are an accidental series of events. Ideally, we should not be able to tell where one person leaves off and another starts. That last one is a little too long to be a Tweet, but the point is that Alexander’s short poems tend to be very short, and it’s a fact that she’s an adept Twitter user (over 16,000 tweets as of the writing of this review). Still, these small poems pack in huge ideas. These micro moments—a smile, a prayer before sleep—enter into the macro: how do I believe, and in what, if I believe in anything at all? The living room could no longer hold all of the dead fish that had been piling up for the past week, so we opened the windows and let the tiny silver bodies spill out onto the street. While some of these poems may strike the reader as akin to social media, their sentiment is earnest. Alexander is a poet unafraid to engage with big questions, unafraid to attempt answering them. Using contemporary diction Alexander updates tried-and-true poetic images to create poems that live comfortably in the age of the Internet. What other poets are using modern forms, language, and images to engage with big themes and questions?